The Rock River Chapter urges Rock River Valley residents to take a few simple steps to prevent home fires and help prepare their home and family in case a fire happens. Nationally, the number of homes fires the American Red Cross responds to is up 10 percent since the year 2000. Alarmingly, only 26 percent of families have actually developed and practiced a home fire escape plan, according to a May 2006 poll conducted by ORC International for the Red Cross. Keep anything that can catch on fire away from your stove top, oven or any appliance that generates heat. Keep all potential sources of fuel like paper, clothing, bedding or rugs at least three feet away from space heaters, stoves or fireplaces. Never leave cooking food unattended, and avoid wearing loose clothing or dangling sleeves while cooking. Install a smoke alarm on every level of your home and outside of sleeping areas. Test smoke alarms once a month by pushing the test button and change batteries once a year. Make sure everyone in your family knows at least two ways to escape from every room of your home. Practice your fire escape plan at least twice a year. Designate a meeting spot outside and a safe distance from your home. Make sure all family members know the meeting spot. The Red Cross depends on the generous support of Rock River Valley residents to respond to our neighbors who are affected by home fires. You can help the Red Cross continue to help fire victims by making a financial donation to the Rock River Chapter today. For more Red Cross fire safety and preparedness information visit www.redcross.org/homefires or call: (815) 963-8471. AMY J. 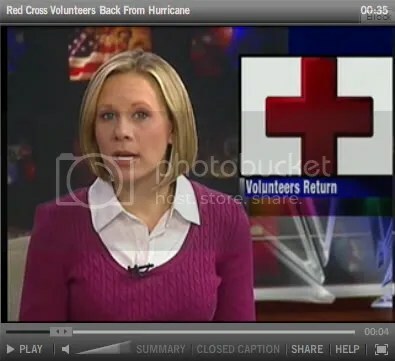 VAN HORN | RRSTAR.COM Lora Gilbert talks about her Red Cross volunteer work, including a recent trip to the Gulf Coast to help hurricane victims.Three years ago, Lora Gilbert watched as images of destruction and grief flooded her TV screen. Hurricane Katrina had just hit the Gulf Coast, and there was no way to escape the constant barrage of sad story after sad story. The then-Loves Park resident knew no one in harm’s way. Her home, car and all of her belongings were safely 1,000 miles from the devastation, 740 feet above sea level. She didn’t dial a friend to talk about what she had seen and how it saddened her. She called the American Red Cross. Gilbert never did get to help with disaster relief efforts for Katrina. She had yet to go through training. But earlier this month, she and two other Rock River Valley residents left their Rockford area homes for Louisiana and Mississippi where they played crucial roles in relief efforts for Hurricanes Gustav and Ike. For two weeks, Gilbert did damage assessment and client intake, meeting with hundreds of people whose homes and belongings were destroyed. Mike O’Brien of Rockton and Greg Larsen, who were on a three-week deployment, hauled hundreds of meals each day to shelters and people working in the field. They, along with hundreds of other volunteers from across the country, worked from before sunrise until well into the evening making sure people were fed, had a place to sleep and were getting the help they needed to get their lives on track. Gilbert, O’Brien and Larsen are three of the Rock River Chapter’s 161 volunteers who are trained in disaster relief operations. The Rock River Chapter had more than 98 volunteers assisting in Hurricane Katrina efforts. That number includes volunteers on the Gulf and in the Rock River Valley who help evacuees as they relocated to the Rockford area. Gilbert, O’Brien and Larsen were the only ones to assist in hurricane relief efforts this past month. Cedric Johnson, American Red Cross Rock River Chapter community relations and development specialist, calls them and other volunteers the backbone of the organization. Gilbert, a Realtor with Dickerson & Nieman, spent her days trudging through mostly rural areas of southern Mississippi going from small town to small town, doing face-to-face interviews with people at their wind- and water-damaged homes. She saw a lot of tears. O’Brien, a 54-year-old machinist, came back with similar thoughts. The day I started working at the Red Cross was the day I purchased a first aid kit for my car. Thinking to myself, I will probably never have to use this kit, but it doesn’t hurt to always be prepared and ready. So, one night as I was driving home and stopped in Rochelle, Illinois for some gas and while waiting in line to pay a lady walked in looking distressed and holding her thumb. So, while in line she asked the attendant if they had any bandages or splints, they didn’t really have anything for her. I responded to her saying “I have a first aid kit in my car and I work for the Red Cross.” “I can help if you need it.” At that moment it was inspiring to see her face change from panic to a much more calm state after I told her I could help and I was with the Red Cross. We walked out to my car and I got my first aid kit out. I bandaged up her thumb and then wrapped it up to make sure there was some pressure on her thumb to help brace her thumb and help with any bleeding. She thanked me and was happy she can go home and put her 3 year old son to bed who was waiting in the car. Listen to the audio from that night I recorded on my way home via Utterli in the player below. 13 year old Raymond McGee Volunteers with an American Red Cross shelter. “We’ve got a great spot for you at the Red Cross. If you want to come help out, you can.” Watch the video below. You are standing in the bleachers of a baseball game. Suddenly, there seems to be a ruckus forming amongst the fans. You glance over and see there is a person lying on his back; he looks unresponsive. Even though there are several bystanders, no one seems to be taking action to help. Everyone continues to simply stare at one another. The person needs help from someone. That someone could be you!If placed in this type of situation, would you step up to help? Are you prepared to react? Most people hope they are never faced with something like this. However, given the number of injuries and sudden illnesses that occur in our country every year, you might have to deal with an emergency someday. Please consider the following: Over 40 million injury-related visits were made to U.S. Hospital Emergency Rooms in 2003. More than 70 million people in our country have cardiovascular disease. If those numbers do not speak loudly enough, I will put this in simple terms. You need to be prepared to handle an emergency. Our community needs people who are willing to step up and help others. Think of your neighbors, friends, family, and all of your loved ones. You may be wondering how to go about getting the training you need. The American Red Cross – Rock River Chapter can help you get the quality training you need to be prepared for situations like this. Below is a link for our upcoming classes. You can call the chapter at 815-963-8471 to register and attain more information. You can also register online at www.rockriver.redcross.org. The ball is coming your way so please put up your glove and make the right move! Click the link below to watch the story. You are currently browsing the American Red Cross - Rock River Chapter Blog blog archives for September, 2008.